Community Enablers of Calhoun County serves Anniston, Oxford, Hobson City, and surrounding communities in the county. The purpose of the organization is to ensure that the needs of the community, whatever they may be, are met. The Community Enablers provides those in need with food, clothing, furniture, school supplies, and any other necessities it can to help citizens make it through difficult times and get back on their feet. From these humble beginnings, the program has developed into a much-needed resource for struggling families. By reaching out into the community, Holloway and her fellow do-gooders have managed to create a unique program that strives to tackle the difficult problem of poverty and hard economic times. Headquartered in a small and unassuming building pressed up against the Anniston YMCA and Methodist Church off Noble Street in downtown Anniston, the Community Enablers may at first be difficult to find. However small, the building provides basic needs to approximately 5,000 people a year and that number continues to grow. Working with limited funds can be a challenge. However, much of the food that is given away is donated directly to the Community Enablers from local supermarkets. All of the clothes are donated by other citizens in the area. Despite relying mostly on donations, the Community Enablers always has a large selection of food and clothing. Visitors of the center, after completing applications and providing identification, are welcome to enter the food or clothing rooms and choose their own items. “There’s no sense in giving them a bunch of food or clothes they’ll never use, so we let them choose,” says Holloway. Another very important factor for Holloway when running a community-aid program is to make sure those that come in are not ashamed to ask for help. After serving the community for 42 years, Holloway has plenty of inspiring stories to tell. One story in particular is a stand out. Near the beginning of the Community Enabler’s founding, there was a local man who was building a new bathroom on his house. The bathroom was great, but he did not have any plumbing system in his house. Holloway, together with the Enablers and other community groups, worked to dig a well for this man so he would be able to use his new bathroom. “He told me that we changed his life,” Holloway commented as she remembered that special day. With every great story there are also great challenges. Servicing an entire county is not an easy task, and it is a constant struggle to keep enough funds around. Holloway says the most challenging part of providing this service is not being able to provide everything. She would like to have enough money to help with medical bills and bus passes, but these things can add up quickly. 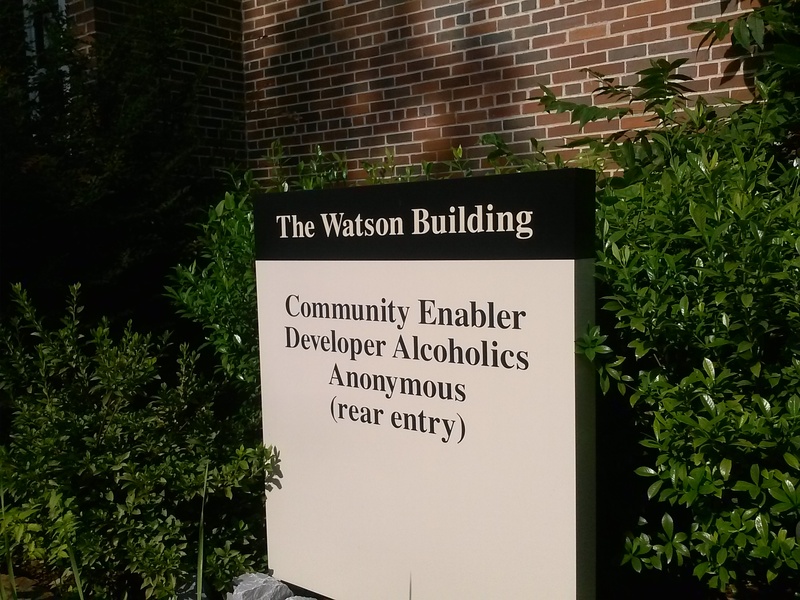 In the meantime, the Community Enablers also functions as a kind of “hub” for assistance. If they can’t provide you with something that you need, they can most likely point you in the right direction. Holloway also started the Sable Learning Center for children in Hobson City. 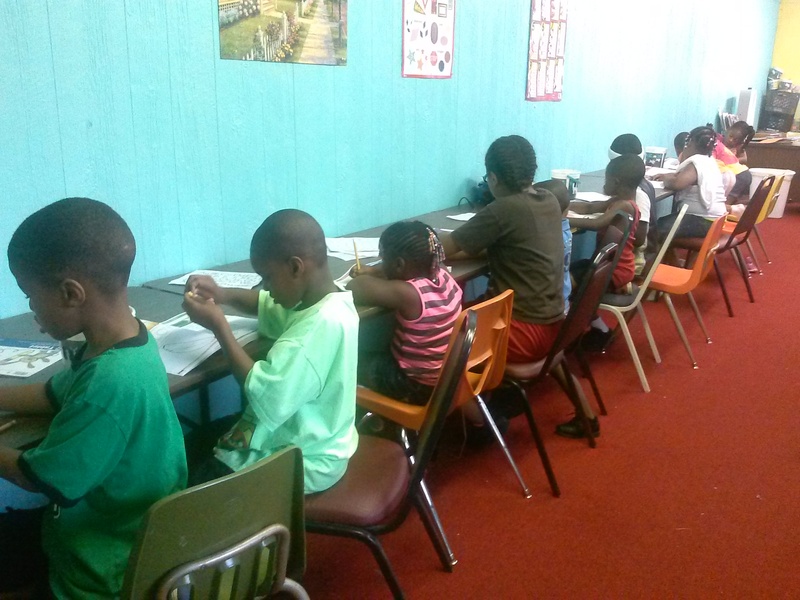 The Sable Learning Center is a free afterschool and summer program that provides children with a meal and additional education away from school. It is another challenge to fund the Sable Learning Center, but Holloway remains hopeful. This persistence is what has kept these programs running decade after decade, through the good times and the bad. Surely the Community Enablers will continue to serve the area of Calhoun County for years to come, and thousands more will benefit from Holloway’s dedication. used to be Hobson City’s C.E. 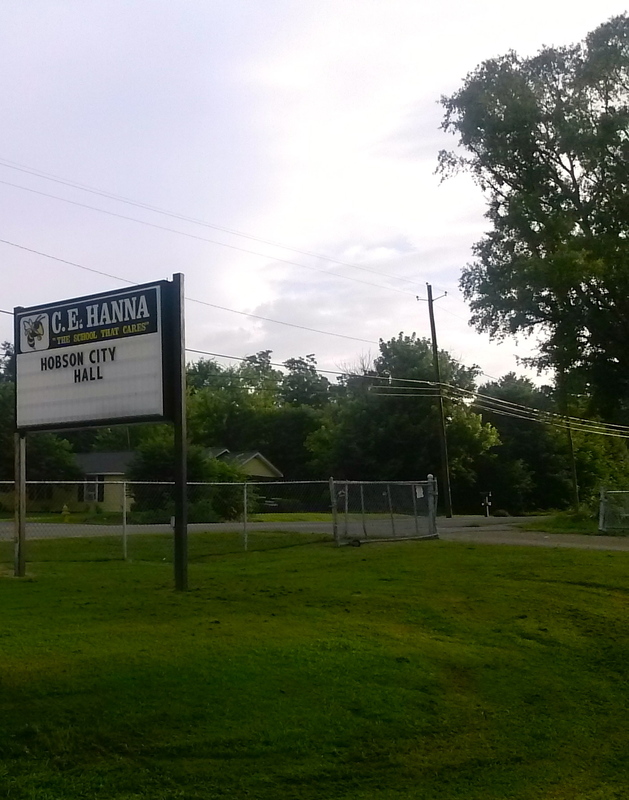 Hanna School, one will find the city clerk, the mayor and the rest of Hobson City’s city hall crew. 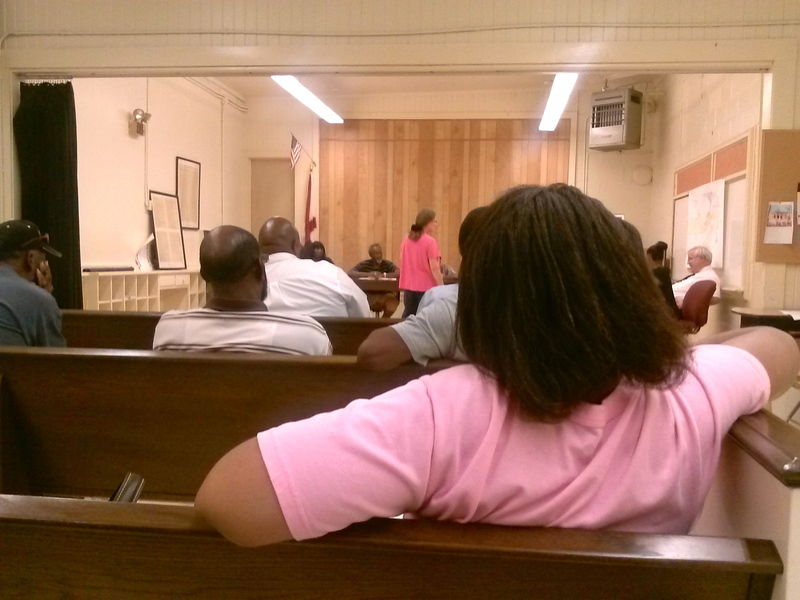 The meetings, held every other Monday at 6:30 p.m., take place inside the old school that now serves as city hall. Just inside the long, open room where the meeting occurs are two stacks of handouts for the attendees of the meeting. One stack contains the minutes and other information from the previous city council meeting and the other stack is the agenda for the current day’s meeting. In addition to the usual crowd of city council members, city employees and the mayor, everyday citizens are welcome to join the discussion and take part in their own government. A surprisingly large group of citizens came out to see what was going on in their community at the city council meeting of July 22. As citizens filed inside the room and into the old church pews, the meeting was soon called to order. After the beginning prayer and reading of the previous meeting’s minutes, the first issue was brought to everyone’s attention. Hobson City is planning a community celebration to bring all of the town’s local churches together on August 19. In a town of 765, the churches are extremely important in uniting local citizens. The hopes of this special celebration are to further develop that sense of community. The mayor, clerk and city council members discussed the details of this celebration and shared in the excitement of a community-building event. Diane Glenn then approached the city council members to discuss a promising grant application. The Community Development Block Grant (CDBG) program under discussion could potentially provide Hobson City with $350,000 to use toward renovating old and damaged properties within the town’s city limits. The city had applied for the CDBG program the previous year but was not awarded the grant. Glenn explained that a crucial piece of the grant application is showing that the city and/or property owners would be able to maintain the renovations. The council members discussed how this could be done and how much of the city’s money could be set aside for this project. Although most of the council members were hesitant to make any monetary commitments from the city, the benefits to the city in the event that it was awarded the grant were apparent. At that point there was a consensus that it was time to take a leap of faith and commit to finding one percent of the total grant amount, $3,500, to continue to seek the funds. Other topics discussed at the meeting included a nearly $3.5 million project to improve the city’s recent water problems. What all of the topics of discussion had in common was a feeling of hope for brighter days to come. Initial reactions to such enormous and sometimes daunting projects may be that a tiny town of less than 800 people like Hobson City isn’t up for the challenge or that there simply aren’t enough funds. In many cases like these, all it takes is one person to stand up and believe that change can be made to inspire the rest to stand together and get things done. 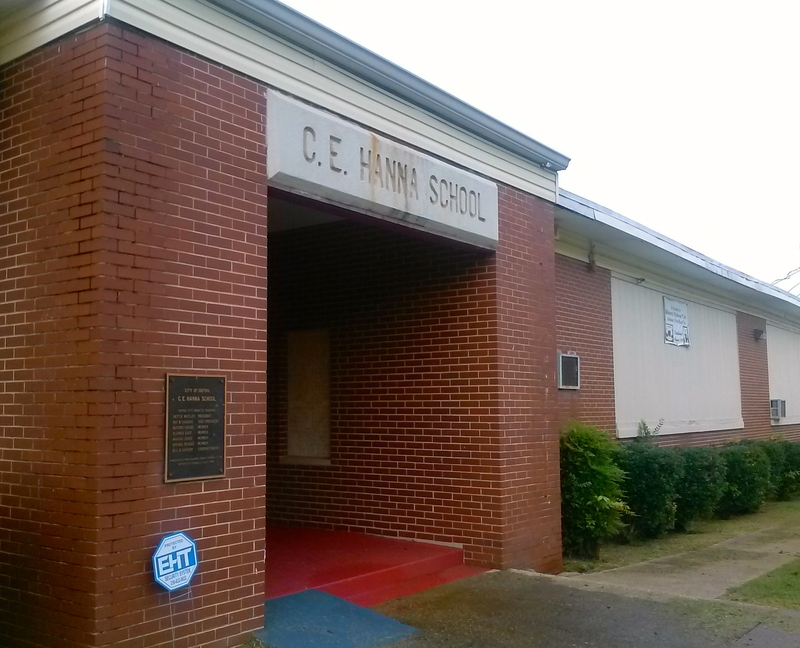 The Sable Learning Center in Hobson City is a prime example of how much needed programs can persevere, through the good times and the not so good times, for the sake of the community. Opened decades ago by Maudine Holloway, the Sable Learning Center has always been a safe place for the children of Hobson City to go after school and during the summertime. Teachers at the center would give them extra attention outside of school and would often take the children on educational field trips. But budget issues have put more stress on this previously thriving program. Although parents can give donations for the services provided, the center is free for children of all ages. Many of the Sable Center’s youth come from low-income homes. In the summertime, the children are fed breakfast, lunch and snacks throughout the day. They also have access to an in-house library of books and other learning materials. In the past, they have relied on the city and private donations to keep things up and running. In recent years, however, the Sable Learning Center has struggled to come up with adequate funding to continue its programing. Low on staff and materials, Holloway has been searching for ways to keep the children engaged during their eight-hour days at the center. Various local church groups come and volunteer with the children on a regular basis, which gives the kids an opportunity to do new and exciting things. This summer, the Sable Learning Center has paired up with the Hobson City Public Library to maximize the potential of both. The Hobson City Public Library offers an extensive summer reading program full of all types of daily activities. 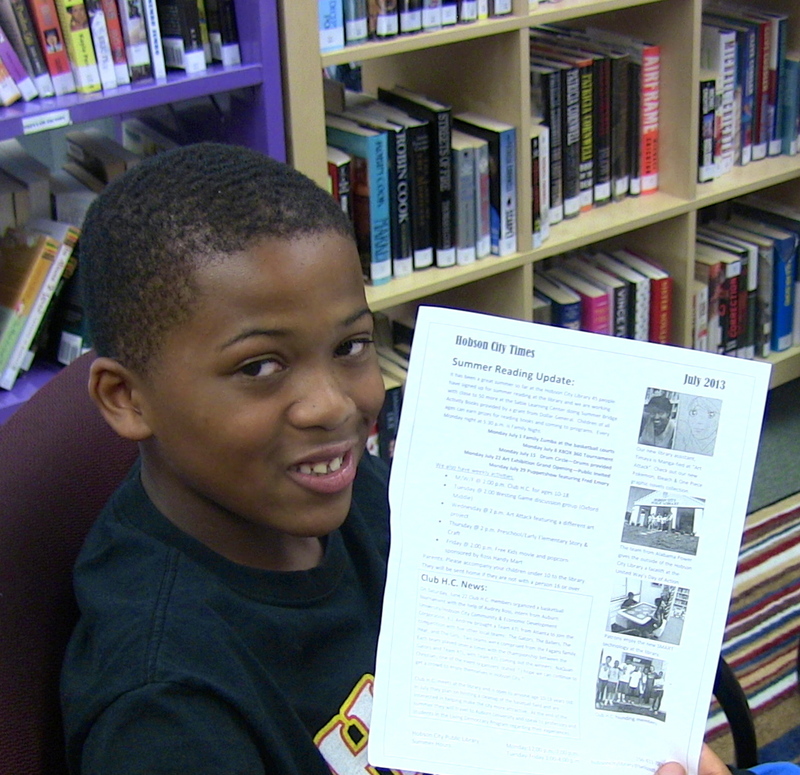 Although the kids at the Sable Learning Center can’t come to the library every day, the library is now coming to them. Every child who enrolls in the summer reading program is given a simple reading test and assigned a workbook according to their grade level. These workbooks are designed to help bridge the gap between grade levels during the summer. Children can complete activities in the workbooks to earn a Hobson City Library t-shirt and other prizes such as candy, fake mustaches and other fun toys. 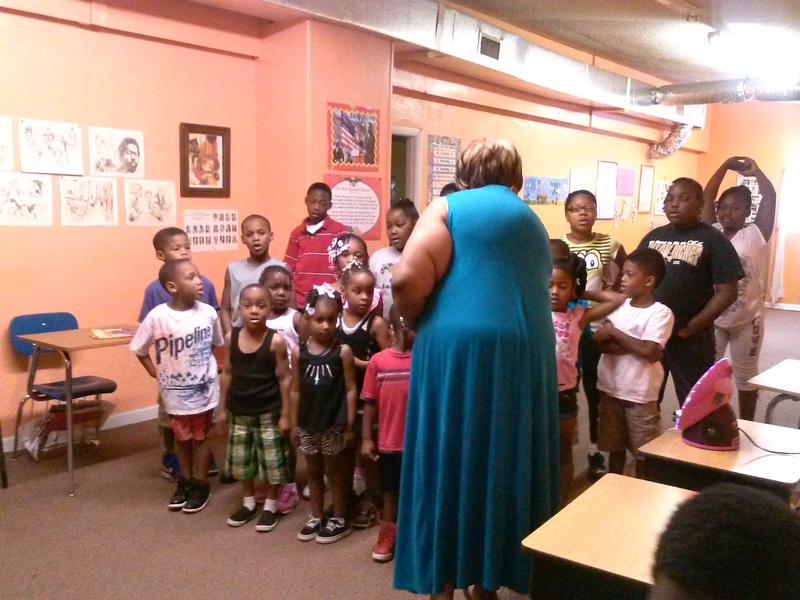 With the help of Hobson City librarian Donna Ross, all 40 plus children in the Sable Learning Center were given a reading test and score in June. They were then given their own workbooks and presented all the prizes they could win if they worked hard to complete their workbook activities. On the day the workbooks first arrived, the children were grouped according to grade levels and allowed to help each other. They were originally given 15 minutes to work. But when the timer sounded, they begged to keep working. There was so much excitement at having something to work toward and accomplish, and they did so diligently for the following days. After a few weeks, librarian Ross returned to see how many children had completed 10 activities. Each child who had done so received a Hobson City Public Library t-shirt and was encouraged to continue completing activities to earn more prizes. Those who hadn’t yet completed 10 activities had even more incentive to keep going. 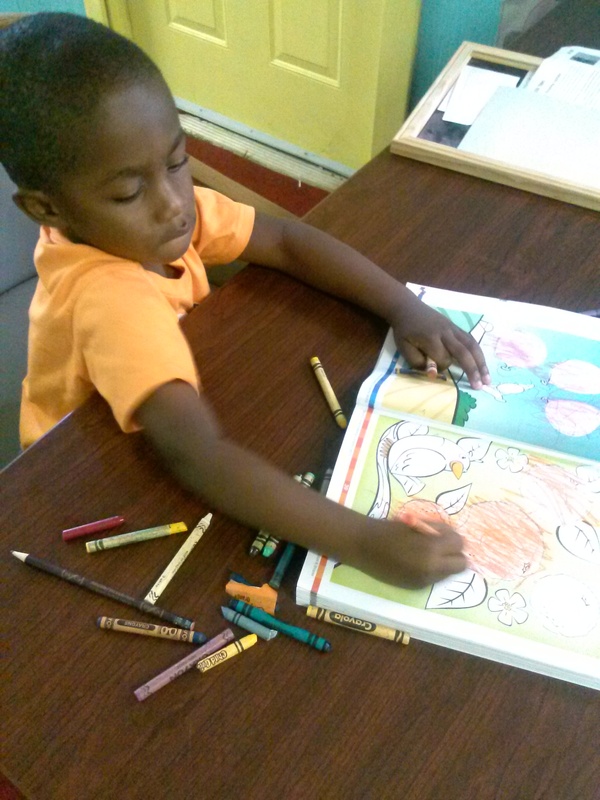 The pre-k children were initially left without workbooks as there were no preschool workbooks with the summer reading program, but with more help from the library all the preschoolers at the center were also able to get their own workbooks and work towards prizes. Although the workbooks were a great first step, there was still an issue with the lack of staff at the Sable Learning Center. This problem has been greatly alleviated by the addition of a buddy system at the center that pairs each younger child with an older child to help them with reading, writing and other activities. The younger children benefit, and the older ones can experience what it’s like to be a leader and a mentor to another child. The effects of this system on both parties are tremendous, not to mention the help it provides for the teachers and staff. 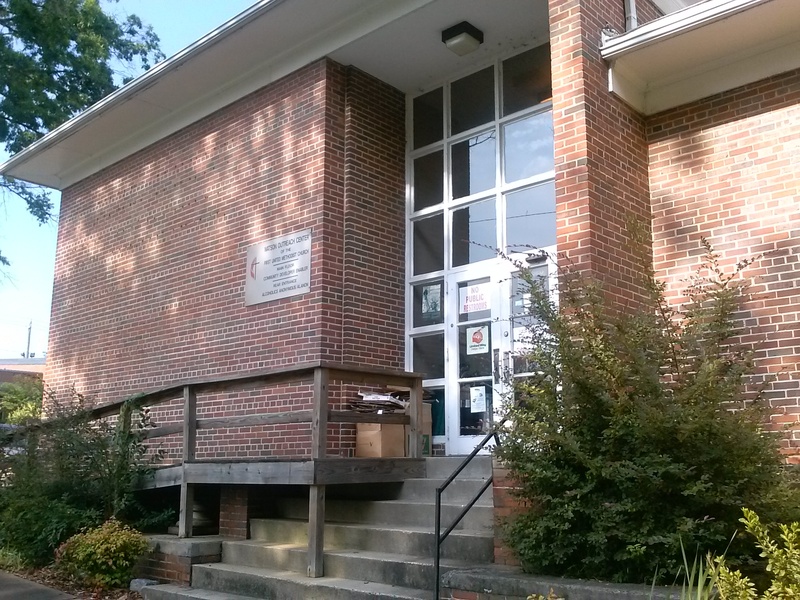 The Sable Learning Center has been in Hobson City for many years. Throughout the years, many things have changed but one thing has stayed the same: Holloway’s dedication to providing Hobson City’s children a place to learn. With the help of the community, the Sable Center will continue to provide this for years to come. There is more progress to be made, but the center has made great strides this summer. 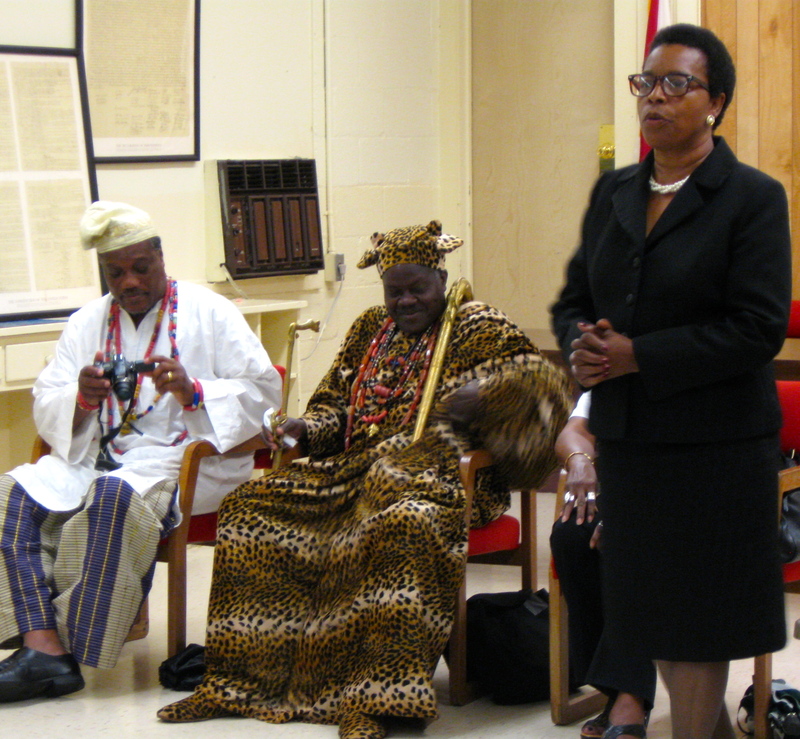 Hobson City was honored this weekend to have one of the few remaining west African dynastic kings come to town and speak on behalf of his people and his ancestors. Kpoto-Zounme Hakpon III is the king of Porto-Novo, a province in the small country of Benin bordering Nigeria and Ghana. Among the reasons for his visit to Hobson City was the 75th anniversary of the Cunningham family with which Hakpon is distantly related. Several minutes before the king’s arrival, a long line of motorcyclists and cars could be seen waiting upon entering town. A large banner featuring a photo of King Kpoto-Zounme Hakpon III on his throne was strung across the telephone poles to give the king a warm welcome to Hobson City. The community-wide event was set to take place at Hobson City’s historic cemetery where relatives of the Cunningham family are buried. Due to the rain, however, the king’s visit was pushed into the city hall facilities at the last minute. Waiting for the crowd and King Kpoto-Zounme Hakpon III was a musician playing traditional African instruments and singing welcoming songs. People young and old gathered around the entrance avoiding the drizzling rain to listen to the interesting cultural music. Just as the musician began to increase the intensity of his song and onlookers became more entranced with his playing, the single string on his instrument snapped. Disappointed only for a moment, the crowd pondered how to fix the instrument together. Librarian Donna Ross and her daughter Adria happened to bring with them an African drum that the musician was familiar with, and the music continued. Suddenly over the music, loud police sirens could be heard. Everyone peeked out of the rain shelter to see what all the commotion was. As we looked to the streets, we could see two police cars with their sirens and lights on full blast followed by a pack of local motorcyclists revving their engines. As the motorcyclists passed, they were followed by a long line of cars. The crowd watched as, one-by-one, the cars slowly passed and the passengers waved. A large crowd gathered to hear African king’s remarks. The parking lot was filling up and guests started coming out of their cars, umbrellas in hand. The rain was now coming down quite hard, but that didn’t stop the friendly smiles and handshakes shared between friends, relatives, and neighbors. The guests started filing in city hall, many of them wearing matching blue and white shirts to commemorate the 75th Cunningham family reunion. In front of all the guests came King Kpoto-Zounme Hakpon III. He was dressed in a leopard-patterned robe, leopard shoes and a five-pointed leopard hat. He had hanging on his left shoulder a golden staff with a small leopard at the top. He carried a golden cane in his right hand. Mayor Alberta McCrory welcomes king to Hobson City. It took several minutes for everyone to get into the small space used for city council meetings. All of the rows of seats were full, and there were people standing all around the room. At the front of the room sat King Kpoto-Zounme Hakpon III with two members of his council. The mayor and city board members sat to the right in front of the crowd. Mayor Alberta McCrory began the event by welcoming and thanking everyone who came out on that rainy day. She then gave a sincere welcome to King Kpoto-Zounme Hakpon III and his party and continued with a brief history of Hobson City. After concluding this portion of the meeting, Joyce Hope Scott, a professor at Wheelock College in Boston, introduced herself as King Kpoto-Zounme Hakpon III’s translator and representative in the United States. Scott shared with those in attendance information about the country of Benin and about the king’s place there. She also spoke about his previous visits to the United States and of his recent trip to Birmingham to see the Civil Rights Museum. Scott explained that King Kpoto-Zounme Hakpon III wished to apologize on behalf of his ancestors who participated in the slave trade for the suffering of African Americans. She also expressed his desire to establish a sister city relationship with Hobson City, the first incorporated all-black municipality in the state of Alabama. When it was King Kpoto-Zounme Hakpon III’s turn to speak, Scott informed the audience that he would only speak in his native language in public. His councilman would translate his words into French, which Scott would then translate in English. This was done in respect for the king’s ancestors, who could only understand his native language. The king began his speech by expressing the importance of women in his culture. He was very pleased to see a woman as mayor and women on the city’s board. He also spoke of the importance of knowing your history and remaining close with your ancestors. With each eloquently delivered line, the audience applauded in respect and admiration for King Kpoto-Zounme Hakpon III. As the inspiring speech reached an end, King Kpoto-Zounme Hakpon III presented the mayor with a key to the city of Porto-Novo. The mayor then presented the king with a key to Hobson City and a special United States flag that was flown in honor of the city. King Kpoto-Zounme Hakpon III ended the ceremony with a long prayer in his native language. He blessed all of those in attendance and all of those in Hobson City and surrounding areas. A glass of water was poured on the soil in remembrance of ancestors, and the crowd dispersed, inspired and touched by the king’s visit. 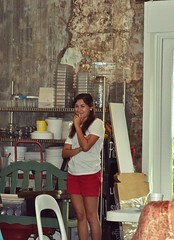 The H.C. Club was organized by summer by 2013 Living Democracy Fellow Audrey Ross. She is working with the Hobson City Community and Economic Development Corporation and other local citizens. The group meets regularly to plan events and projects to benefit Hobson City. Members recently organized a basketball tournament with six teams participating. NaQuan Christian, one of the tournament organizers, said he hopes to continue to work to create opportunities for youth in Hobson City. Club H.C. meets in the library and is open to youth age 10 to 18. 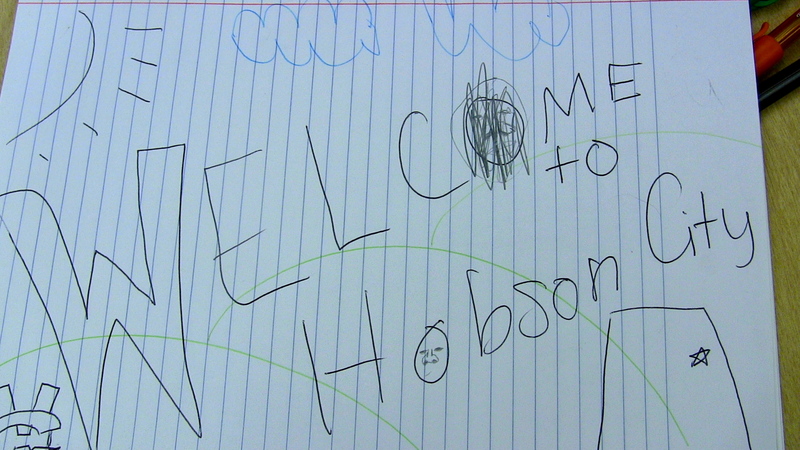 Their next project is planning community beautification efforts such as a Welcome to Hobson City wall mural. Members of the group, in addition to NaQuan, are Jessenia Howard, Nykeria Howard, Antonia Marquez, C.J. Howard, and Jacorius Ball. 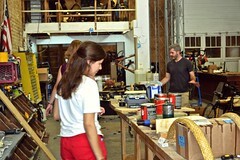 Ross said the founding members of the group are working hard together as they develop projects to benefit the community.